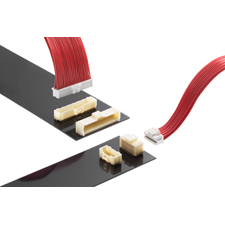 LISLE, IL – November 6, 2018 – Molex announces the release of a new set of 1.00mm pitch wire-to-board Pico-Clasp Connectors. The connectors offer a variety of mating styles and orientations, plated in either tin or gold to meet flexible design specifics. Molex Pico-Clasp Wire-to-Board Connectors are ideal for customers in the consumer, industrial, automotive, and medical industries. The new connectors range in circuit size options, from 2 to 50, in single- and dual-row configurations. Wide header versions make them ideal for compact applications. Thick gold plating provides security that the connectors will remain reliable and intact even in harsh weather conditions. Molex Pico-Clasp Connectors have an easy-to-mate outer positive lock combined with both a space-saving inner friction lock and a positive inner lock that prevents wire tangling and latch breakage. The 1.00mm pitch is one of the smallest on the market for positive lock Wire-to-Board crimp systems and offers a 1.0A current rating. When compared to similar available products, the Pico-Clasp Wire-to-Board Connectors offer more available circuits; generally smaller mated width, height, and length; and both friction and positive locks. For more information about Pico-Clasp Wire-to-Board Connectors, please visit www.molex.com/link/otscableassemblies.html.